CH and I enjoy going out and trying new restaurants, new cuisines and new perspectives on the cuisines we love. Going out to restaurants inspire me to re-create many dishes at home, so we can enjoy them more often. We have grown to love Thai food. Lemon grass, kafirr leaves, cilantro….I could go on and on. I was always intimidated to try cooking Thai at home as the flavours were always so perfect and I didn’t think I could re-create them. But that changed quickly! As a wedding gift, we were given a cooking class at a local store/gourmet cookshop! Luckily, the one day CH and I had off together, they were offering a Thai cooking class. It was a great experience and we received some delicious recipes – this was one of them! Feel free to play with the ingredients – if you don’t like tofu, omit it! If you don’t like shrimp, use (cooked) chicken! 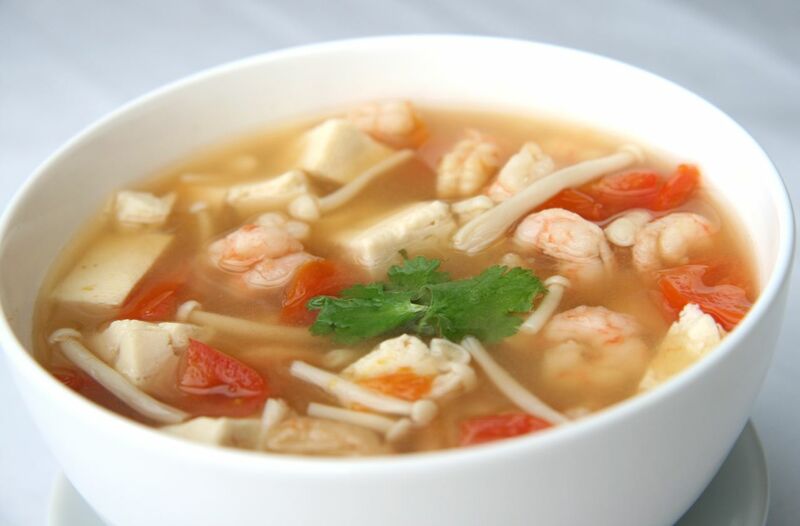 This soup really depends on your palate, so taste the soup as you add the ingredients, and adjust to your preference. It’s a very forgiving soup, so don’t be worried. The other bonus, this soup is SO quick to prepare. Literally, on the table in under 20 minutes. You have to love that. I paired it with a Thai Mango Salad, which will be posted soon, and it made a perfect lunch! In a large saucepan, over high heat, bring chicken stock to a boil. Once chicken stock is at a boil, add in ginger, kafir, lemon grass and red chilies. Reduce heat to medium and simmer for 5 to 10 minutes. Give it a taste after 5 minutes, if you are happy with it, proceed with next step. If you want a little more flavour, continue to simmer. Once the broth is ready, remove ginger pieces, kafir leaves, lemon grass stalks and large pieces of red chilies. Continuing over medium heat, add in the lemon juice, fish sauce, sugar and soy sauce. Stir and allow flavours to meld together for a minute or two. Give it a taste and adjust fish sauce/soy sauce to your liking. 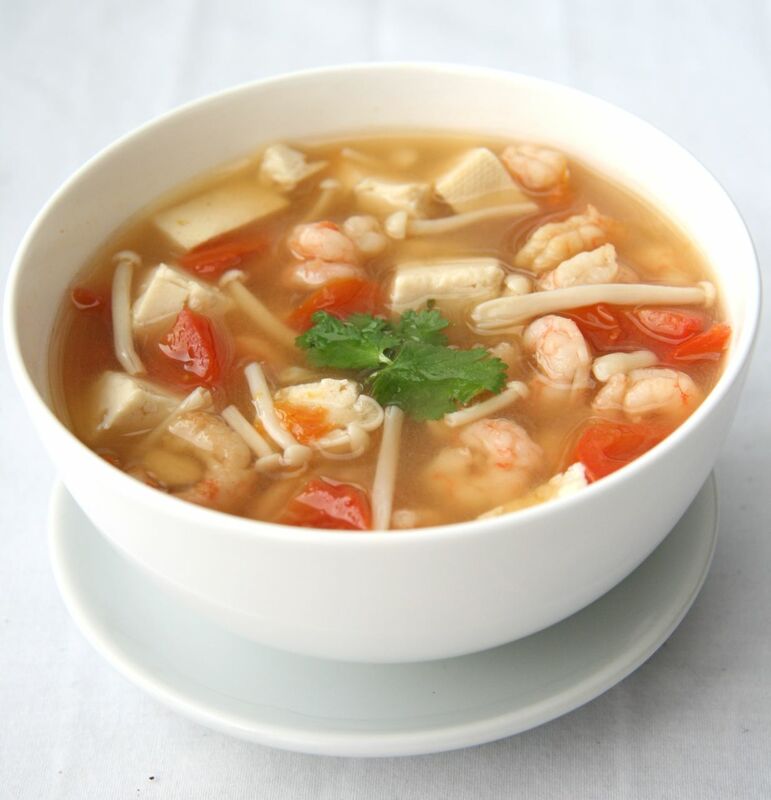 Once you are happy with the broth, add in the shrimp, tofu, mushrooms, spinach and cherry tomatoes. Simmer for 5 to 10 minutes, until shrimp are cooked and mushrooms/tomatoes are soft. Serve immediately and garnish with cilantro!